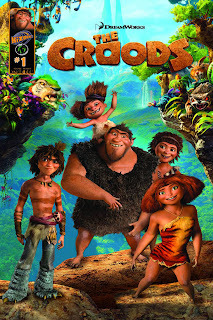 The Croods is the latest movie by DreamWorks and is being released in theaters March 22nd. And you know what, I have passes to give away! Crazy right? Well it's true!!! I cannot wait to give these passes away! So like the ticket passes I had for Parental Guidance, I need you to toss me an email letting me know you are interested. I will then forward you the promo link. I would like you to "like" my facebook page, I would like you to subscribe to my blog. These are not requirements, but I would like it in exchange for the promo codes. Also, you have to be in the Seattle metro area to be eligible. So please, drop me an email at sowderingabout@gmail.com and I will send you the code! PS you have to come back and comment with what you thought of the movie! Save two tickets for your Daddd....Maybe not for this movie, but I would like to goto a movie when we come up to visit.....Oh, better save one for Candy also....And one for Louie and LJ....And we will need some popcorn(no butter) and some cokes! !